Someone has a sense of humor, I saw this in the center of town while walking Wolf. I vote it is a hardboiled egg – or an egg cooked or not. Ooooh, Michelle’s guess is good! That could be right, but I had a different guess, so I’ll go ahead and post it. I think it’s a close-up of a Nerf ball. I’m torn between the egg and the Nerf ball. I’ll go with the Nerf ball. 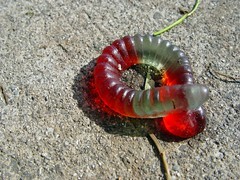 Well, the first one is a gummy worm. Woo hoo! I win. The second one looks like the skin of a fruit or something. Though the egg theory seems possible. I think skin. At first I thought an orange skin but I am going with human skin. I think it is skin too. YUM!! Its a CHEESE DOODLE!!! Hmmm, this is a tough one…but I’m going to go with skin! Good Lord will you EVER let me forget that movie? see, I was right last week, it was a condom….one of those ribbed, multi-colored ones! I think today’s is a pix of a very large pregant women’s belly. The dot to the right is her bellybutton popped out. 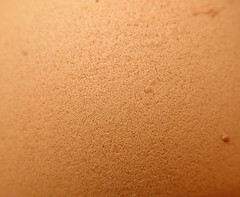 I think it is the surface of a terracotta pot. My first thought was vanilla wafer. But that could be because I am hungry. i believe that’s a close up of the young nubile skin of Pablo, my cabana boy. i’ve been looking for him… please send him back!